The summer is heating up with the presence of national and international celebrities in the Riviera Nayarit. Summer kicked off in the Riviera Nayarit with celebrity sightings all along the beautiful beaches of Mexico’s Pacific Treasure. 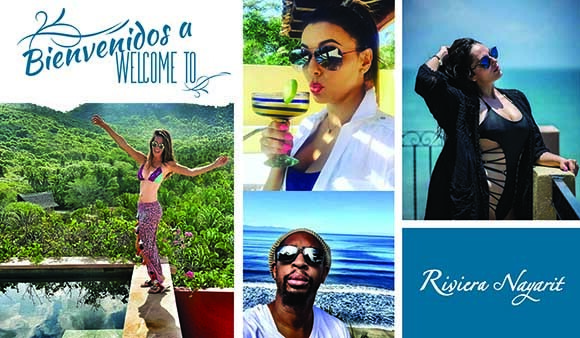 US stars Eva Longoria and Lil Jon and Mexican A-listers Claudia Álvarez and Vania Manzano posted about staying in the Riviera Nyaarit on their social media accounts. Eva Longoria, the multifaceted US movie and TV actress published on her Twitter account (@EvaLongoria) a picture of one of Sayulita’s iconic murals with the message “Más amor por favor” (More love, please). The actress who plays “Gabrielle Solis” in the series Desperate Wives has over seven million followers on the little blue bird’s social platform. US rapper and producer Jonathan Smith, best known as Lil Jon and the creator of the hit single, “Turn Down for What?” was also spotted in the Rivera Nayarit, specifically at the Villa La Estancia Hotel in Flamingos. He posted about his trip on his own Twitter account (@LilJon) where he has over a million followers. Mexican actress Claudia Álvarez happily boasted on her Twitter account (@claudiaalarezo) about her recent romantic escapade to the Riviera Nayarit, posting a pic with her boyfriend Billy Rovzar as they gazed at the beauty of Mexico’s Pacific Treasure. The last celebrity to post about their presence in the destination was TV host Vania Manzano. The curvy Mexican actress posted more than one pic modeling her bikini on her Twitter account (@vaniamanzanof) during her stay at Villa La Estancia, where she taped a TV commercial. Who said you shouldn’t mix business with pleasure? In the Riviera Nayarit, it’s a done deal!